If you are searching for a luxurious holiday villa rental that is ultra-modern in design and enjoys a prime holiday location, then this stunning 4-bedroom house really does hit the spot. It is situated less than a 5-minute drive from the beach, in the heart of Jomtien, and bars, restaurants and shops are just a short stroll away. Although the convenient location of the villa is a main selling point, the luxury design, both externally and internally, are simply breathtaking. Relax on a private back garden, surrounding a stylish private swimming pool with an integrated Jacuzzi. Sunbathe in the loungers or have a snack in the covered terrace area. The luxurious open-plan living areas have very tall ceilings and combine a stylish lounge, dining area and Western-style kitchen into one, looking through tall windows out towards the pool. The lounge is home to a comfy sofa facing a flat-screen TV with DVD and near to the dining area with an 8-seat table. Here you will also find a kitchen with many quality appliances for your self-catering needs. The four bedrooms sleep up to 8 people and come equipped with king-size double beds, air-con and wardrobes. All the bedrooms have ultra-modern designs with ceramic floors. 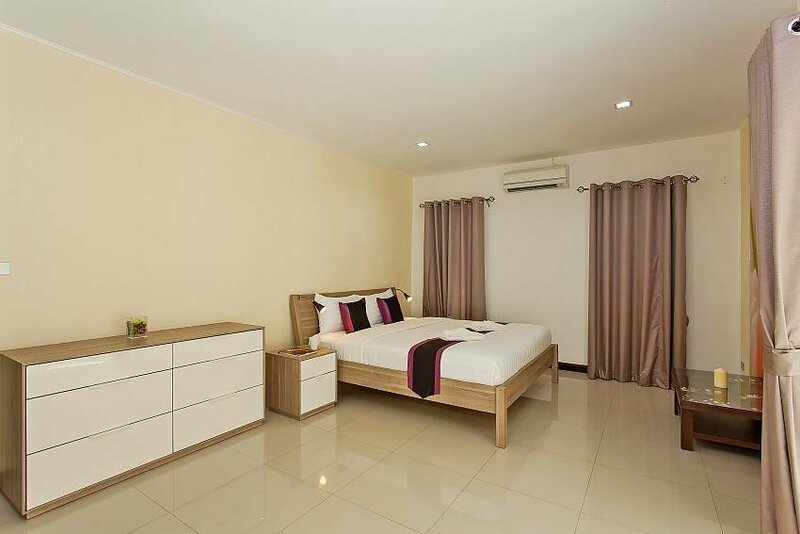 The villa location is in the heart of Jomtien, close to Thepprasit Road and Thappraya Road. Jomtien Beach is under a 5-minute drive and just a short stroll to the myriad of bars, shops and international restaurants.